Gurim’s On Top of The World! It’s already Friday, which means that the first full week of second session is almost over and we’re here to tell you all that it is one for the books. These past few days have been jam-packed with fun peulot, yummy nishnushim (snacks), and plenty of time at the agam (lake) for free swim. On Monday night, we had a night of WORLD RECORDS which may or may not be a sort of exaggeration, but either way, we all practiced competing against ourselves in a plethora of different activities to see the best score we could get in each task. The tasks ranged from cup stacking, to hula-hooping, to repeating tongue-twisters a bunch of times, and each time we improved our own performance, we tracked the record in a special bracket chart. Everyone was up and moving while trying to continue improving themselves during this fun evening activity. If there is one thing that we can say about this week, it is that the weather was SPECTACULAR. Really, we were so lucky, the skies were clear and the air was warm. Hold on a sec, the air was HOT. Okay, to be honest the heat was a little extreme, but that didn’t stop us from spending the entirety of our days in the beautiful New Hampshire outdoors! We worked with the heat, and the heat worked with us. We spent afternoons playing water games, and sliding down the slip ‘n slide, and even found some time to stay cool doing art projects in the shade. On Wednesday, the banot (girls) learned a dance for the upcoming yom Yisrael, an d afterwards, the entire aydah (unit) came together to learn a new tune to Avinu She’bashamayim (Our Father who is in Heaven) with rosh musika (head of music) Benzi Thee. 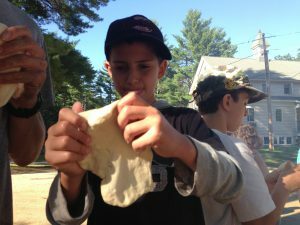 When we were all done, we got to make and eat pita outside with one of our beloved madrichim, Saar. He is from Israel, so he automatically knows how to do these kinds of things. Later that night, we had erev (evening) Tag, which as you may have guessed, was an evening full of different kinds of tag games. Needless to say, it was a huge hit and we were all running around until it was almost dark and time to go to sleep. Yesterday was ACHLA YOM!!!! It was “achla” INDEED! We went to a FANTASTIC water park near camp called Liquid Planet. It was there that we disembarked from our yellow steed (read: school bus) and trudged determinedly through the gates of the park. Once we entered in formation and divided into groups, we set out to conquer what was rightfully ours. We went down water slides too many times to count, and slid down a zipline while waving to all of the measly peasants who squinted up at us from below our dangling feet. We stood beneath water playgrounds and laughed as the water crashed over our anointed heads. “So this is what it is to rule an empire…” we heard ourselves murmuring out loud as we waded through the wave pool. Liquid Planet, as it turns out, was no match for our might. 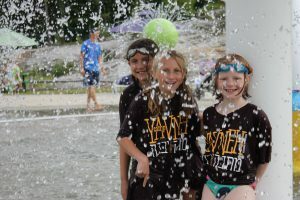 We did all we could and when there was no more fun to be had we filed victoriously and contentedly back onto our faithful steed (again, read: school bus) and returned home to Camp Yavneh in time for a nice shower and some well-earned dinner.